Gaza terrorists continue to fire rockets as Israel's counterterrorism operation moves along. 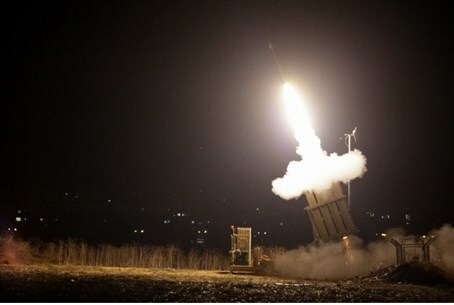 A salvo of rockets was fired on Sunday night, just before midnight, towards southern Israel. The Iron Dome anti-missile system intercepted seven rockets that were fired towards the city of Ashkelon and the Hof Ashkelon region. An hour earlier, a rocket launched by Gaza terrorists exploded in the Eshkol Council region. Also on Sunday, a salvo of rockets from Gaza was fired towards Jerusalem and the Binyamin/Samaria region to its north. Rocket warning sirens went off in Ariel, Shilo and Eli in Samaria, as well as Psagot – for the first time in recent memory. Hamas launched dozens of rockets at Israel over the Sabbath, striking the Judea region south of Jerusalem for the first time - but in areas under Palestinian Authority control. Arabs in Hevron gathered to celebrate the rocket attacks on their Jewish neighbors but instead faced a rocket strike on Hevron itself. Meanwhile, the IDF’s Operation Protective Edge continues. Fearing for their lives, more than 17,000 people have taken shelter in installations of the UN agency for Palestinian refugees. Israeli aircraft dropped leaflets on border areas in northern Gaza on Saturday, calling on the citizens to evacuate their homes before noon Sunday as it prepared to bomb the area.